For children, pets and like-minded adults, backyards are a somewhat magical place where anything can happen and life always seems to feel like an adventure. When Abbey Harrison and her dog, Millie, were looking through the backyard after a tree fell down, they stumbled across a tiny somebody they weren't expecting to see — a baby squirrel with no mother in sight. 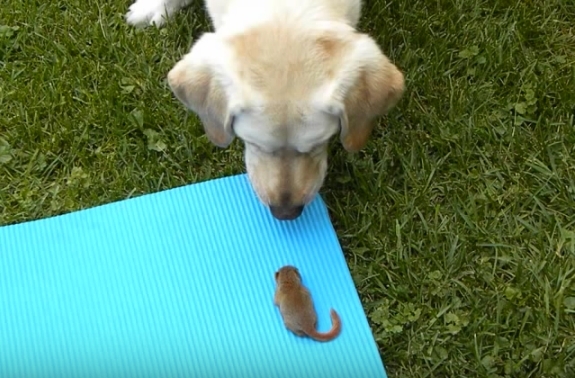 At first, Millie was taken aback by the little guy. Harrison pieced together that the squirrel's family had likely lived in the tree, and he had become separated from his mother. Despite being alone and weighing about as much as a roll of quarters, the squirrel didn't shy away from Millie. The family waited an entire day for the squirrel's mother to come back, but nobody came for him. Harrison took it upon herself to feed and house the squirrel until he was ready to return to the wild. Harrison wanted to make the orphaned squirrel feel welcome during his stay, so she decided to give him a name. After carefully considering the options, she simply settled on "Squirrel." The family gave Squirrel a cardboard box with a blanket as a bed. He had quite a bit of energy and jumped out of the box to reach Millie. After all that running around, the squirrel eventually got tuckered out and nestled onto a yoga mat. Millie finally got a moment to rest. As unusual as the little critter seemed to Millie, she still stood guard over him while he napped. Although Millie and Squirrel got along well, Harrison knew that her house wasn't the proper place for a squirrel to live. Hopefully he's out in the wild where he belongs, burying some nuts and maybe even remembering those happy days with the Harrisons, the folks who saved him when he otherwise would have died. 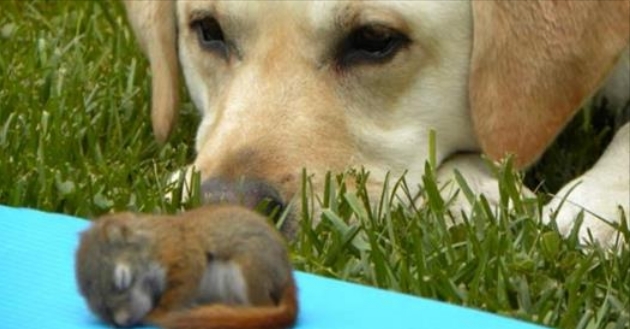 Responses to "Dog Patiently Watches Over Rescued Baby Squirrel As He Sleeps"